Although I find growing from seed one of the most rewarding aspects of gardening, I have done so less and less in recent years. It’s partly down to space, and partly down to the requirement to be present during those critical days when tender seedlings are emerging from the soil – my life just doesn’t allow for that most of the time. Added to which, my requirement for multiples of the same plant is limited to perhaps one or two varieties each season. I have wasted a lot of money on seeds that I have not had the time or need to sow, which pains me enormously. Now I am permanently ensconced at The Watch House the opportunities are greater, which is an exciting prospect for next year. When I do choose to grow a plant from seed it’s often because I have not been able to obtain it by other means. Such is the case with Mirabilis longiflora. I would say it’s ‘commonly’ called sweet four o’clock, but there is nothing remotely common about this Mexican native, either in terms of looks, or availability. 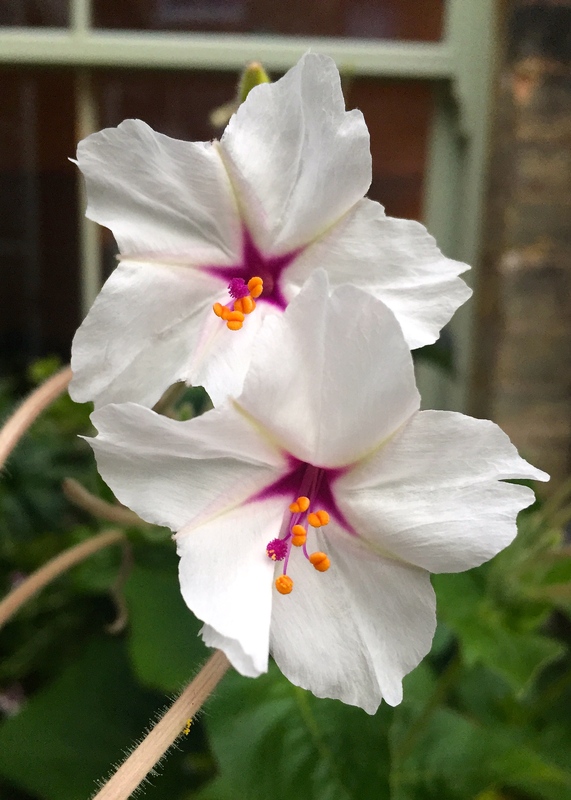 I have always enjoyed so-called Marvel of Peru (Mirabilis jalapa), despite the fact its flowers only open at tea-time, in readiness for the moths that will deftly pollinate them overnight. The plants are emerald-green and bushy, the flowers jolly shades of pink, orange, yellow and mauve, and the scent they produce is heavy and enveloping … slightly reminiscent of orange blossom. Mirabilis longiflora is a more sophisticated beast with soft, tacky leaves and hugely elongated flowers. The variety ‘Angels’ Trumpets’, which I have grown, produces flowers that Gabriel would be proud to hold to his lips. The exaggerated trumpets are white and almost 20cm in length, protruding in generous clusters from the top of each stem. They flare at the end to reveal a deep magenta eye and tangerine stamens. The overall appearance is unusual yet terribly elegant, in the same league as Nicotiana sylvestris, only not as tall. Since I am at work all day it matters not a jot that the flowers are no more impressive than frayed string until the sun goes down, when they perk up and produce their intense fragrance. By morning, as early as 5am, they will be dead and gone, but more will follow as the sun starts to dip towards the horizon again. Seeds sown in spring will flower in the same year and, in mild winters, the plants will overwinter as tubers and regrow the following year. 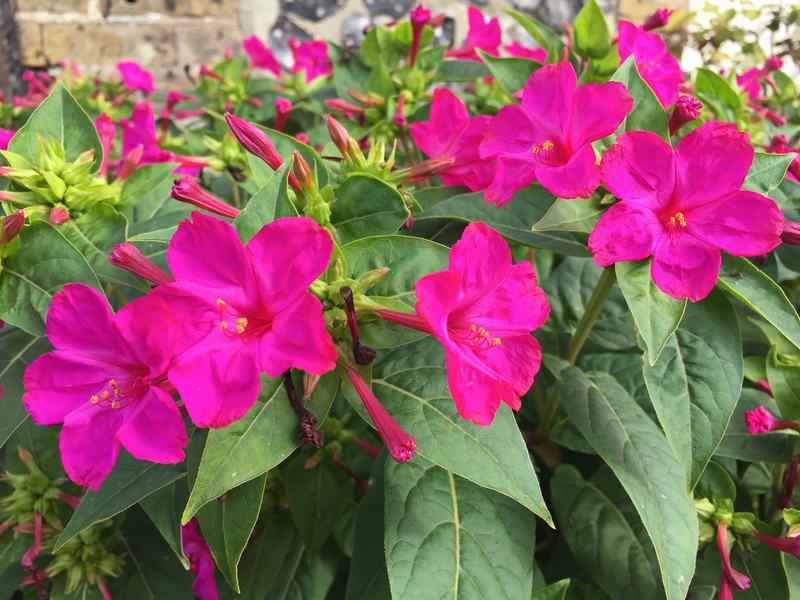 The first flowers this year were produced in late July and I shall be interested to see how long the display continues: Mirabilis jalapa will go on until the first frosts. I am not certain if I like the scent of Mirabilis longiflora or not; it’s pleasant for sure, but somewhat cloying. If I had a larger garden, especially one with herbaceous borders or a large terrace, I would plant Mirabilis longiflora where its perfume might mingle with lilies, roses and heliotrope to make a heady summer cocktail. It would work beautifully with Verbena bonariensis, Californian poppies (Eschscholzia californica), agapanthus and Stipa tenuissima in well, drained, sunny border. TFG. Seeds of both Mirabilis jalapa and Mirabilis longiflora are available from Chiltern Seeds and Thompson & Morgan. I’m the same with bulbs, although those can be planted and left to their own devices. I promise myself every year I will buy fewer, and then I chicken out! Gardening is very addictive. 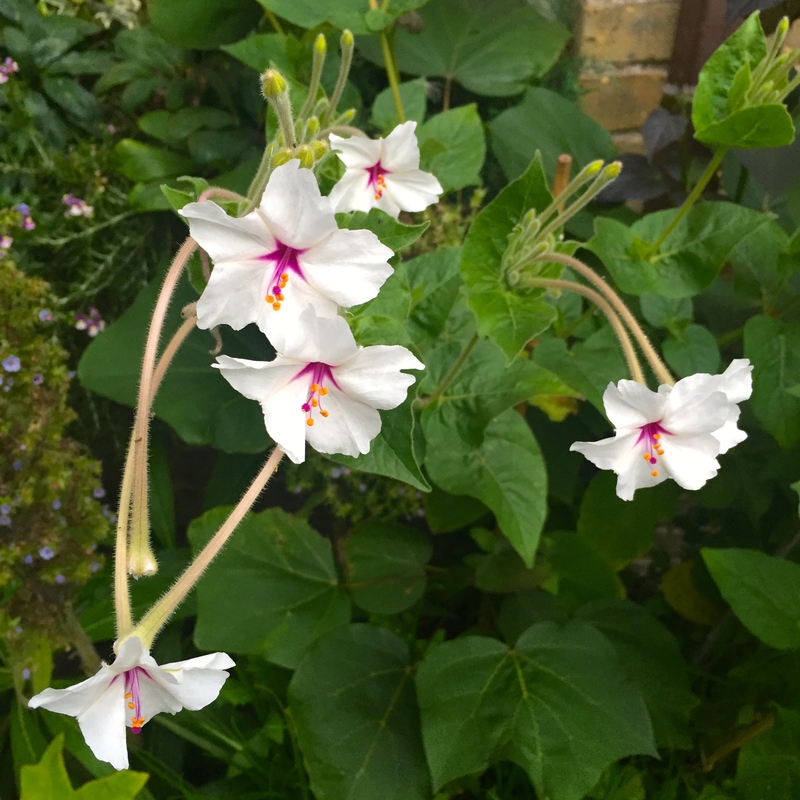 I grow Mirabilis longiflora “Angel’s Trumpets” from seed too. Mine have not yet bloomed, although there are buds now finally. I find I can’t get them to stand up straight. They get mostly full sun, but are subject to a bit of shade first thing in the morning. So I prop them up with wire. I think they are fabulous and exotic. My climate is too cold for them to survive a winter, but I am planing on digging them up this autumn and trying to overwinter with other tender perennials. For those in the USA, Select Seeds sells seed for this beauty. After that you can save your own seed. Mine stay viable for at least 3 years. Great advice for anyone gardening on your side of the Atlantic Dean, thank you! The seeds are tough, like giant peppercorns or small bullets. I omitted to mention the plants’ floppiness, assuming it might just be me over feeding or over watering. However I’ve needed to stake them thoroughly to keep them neat and upright. A small price to pay, but perhaps a good reason to mingle among stiffer plants such a fennel or Verbena bonariensis. I used to grow just a couple of these from the tuber or corms which are available in early spring but a neighbour is bringing some from her parents garden in France where they grow wild, soon….I’ll let you know how they get on…should be easy to dry out like dahlias over winter!